Brief Description: The University of Bonn and the United Nations University Institute for Environment and Human Security (UNU-EHS) are offering up to eight fully funded scholarships for developing countries. Scholarship will be taken in Germany. Scholarship Award: There are Many fully-funded scholarships available. If you are interested in studying in Scholarships Universities in Germany, there are important requirements you need to meet. Read this article “Requirements to Study in Scholarships Universities in Germany”, it explain it in full details. These scholarships are available for pursuing Joint Master of Science (M.Sc.) programme “Geography of Environmental Risks and Human Security.” The ultimate goal of the scholarship is to foster inter-cultural exchange and enable the students to contribute to the sustainable development of their home countries by applying the knowledge they acquired during the study program. Applicants must possess a first, higher education qualification (Bachelor’s Degree) in Geography or a related / comparable professionally certified study programme. Out of all higher education qualifications earned (Bachelor’s, Master’s, additional academic coursework, etc.) applicants must have accumulated at least 100 ECTS (European Credit Transfer and Accumulation System) within courses related to the three following areas: Human Geography and Social Sciences with a focus on spatial patterns, society, development; Science methodology and empirical research methods; Physical Geography, Geosciences and Environmental Sciences with a focus on Earth System Science. A strong motivation to contribute to the area of Human Security and management of risks related to Environmental Change is a pre-requisite to study in this Master’s Programme. Applicants should be highly motivated to learn in a multicultural and interdisciplinary environment. A minimum of 2 years of related professional experience is required for candidates from developing countries who additionally wish to be considered for a scholarship under the Development-Related Postgraduate programmes (Epos) of the German Academic Exchange Service (DAAD). Nationality: Citizens of developing country can apply for these scholarships. 2. English Language Requirement: Non-native English speaking applicants must prove sufficient proficiency in the English language. 2. A signed Résumé/CV A current résumé including a chronological listing of employment and other significant activities must be submitted with any application. 4. Letter of motivation: A written statement, one to two pages in length, describing their motivation, area of proposed research, background, past work in the intended field of study, plans for further postgraduate study and any other information they feel is relevant. Applicants who are currently registered in a postgraduate programme at another university should explain why they wish to change programmes. 5. For non-native English speakers or applicants where English is not the official language, an English language proficiency certificate. 6. Copy of Bachelor Thesis or academic essay written as part of the fulfillment of the first degree (preferably in English). 7. If the candidate wishes to be considered for the Epos funding by the DAAD the candidate should add the DAAD application form, a motivation letter with reference to the current occupation, professional letters of recommendation from your employer (with recent date, stamped and signed), academic letters of recommendation from your university (with recent dates, stamped and signed), as well as a confirmation of employment from the employer in your home country and if possible, a guarantee of re-employment upon your return home. 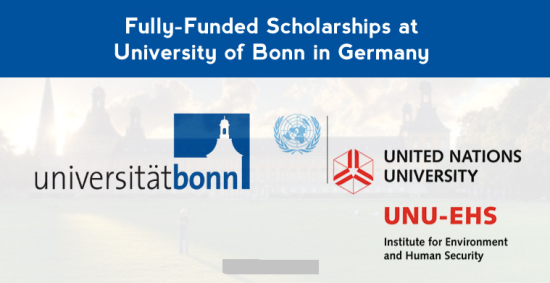 Now that all the information about Fully Funded United Nations Scholarships at University of Bonn in Germany for Developing Countries has been delivered nicely; talented students who are eager to pursue their Free Tuition/Scholarships/Study in Germany, for Bachelor, Masters, PhD, doctoral or postdoctoral level, Associate Degree and Other Degrees, can apply now.